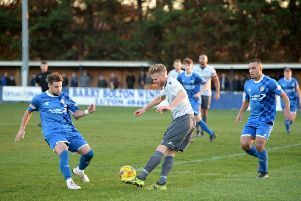 Dunstable Town suffered a 2-1 defeat at Didcot Town on Saturday, as for the second week running, they found themselves unfortunate to leave with nothing. Alex Taylor came back in, while Arel Amu was on the bench to face a side who have been strong in front of their own fans this season. Dunstable began well though, Joe Mead only narrowly wide, but they were ahead on 11 minutes Chris Wreh pouncing on a defensive error and majestically lobbing the ball into the net from 35 yards for his 11th of the season. Daniel Trif went close with a piledriver, but Didcot started to get back into the game, keeper James Connell tested, as were defenders John Sonuga and Mead. An injury to Taylor just before the half hour saw manager Tony McCool bring on James Lauder in midfield. The hosts were level on 39 minutes through Oxford United loanee Brando Taverner, but back came the Blues, Trif almost making it 2-1 after a free-flowing move involving Wreh and Saul Williams, as home stopper Leigh Bedwell saved at full stretch. Trif was once again denied by Bedwell, while in the second half, Didcot finally started to gain the upper hand, Connell needing to be at his best to keep out Taverner. On 70 minutes Dunstable thought they had gone ahead through Wreh’s curler, but with Bedwell beaten, it hit the woodwork and bounced clear. McCool’s side were then hit by a cruel blow, Seth Humphries sliding in at the back post to turn George Reid’s cross home and make it 2-1 to the Railwaymen. Charlie Black and Amu came on as Dunstable searched for an equaliser, with Black going closes, heading over from corner. Saturday’s trip to Bedford Town has been postponed due to the hosts’ involvement in the FA Buildbase Trophy, with the match rearranged for Tuesday, December 4. 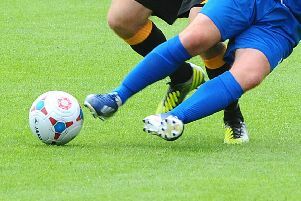 The Blues are at home to Barton Rovers the following weekend. Meanwhile the club’s U21s take on Cranfield in the second round of the Beds FA Intermediate Cup. Goals from player/coach Val Qoku and Darnell Muir-Martindale were enough for the Blues Development team to beat Leverstock Green 2-0 at the weekend. The result consolidates Dunstable’s third place position and sees them only one point behind leaders Westfield but with a game in hand on their rivals.